Windsor's first mayor was born in 1823 in York, Upper Canada; he was the youngest son of Alexander and Ann (Smith) MacDonell, who had immigrated from Kilmonivaig, Invernesshire in 1773. Samuel studied at King's College, earning a Bachelors degree in Law in 1845. Two years after graduation he was admitted to the Ontario Bar Association (he would later return to school to get an LLD). He moved to Amherstburg to practice, and became District Clerk in 1850, a position that connected him with the local elite. 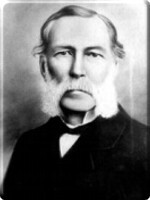 MacDonell was elected to the first Town Council in 1854 when Windsor was incorporated as a village, just one year before he became commanding officer of the 1st Battalion of the Essex Militia, a position he maintained for eight years. He was chosen from among the councilmen to be Windsor's first Reeve, and as elected for the leadership position again when Windsor was incorporated as a town four years later. This first term lasted only for the year, but voters returned him to office for 1864-1867. He was appointed a Crown Attourney and Clerk of the Peace in 1871 and ten years later became a Queen's Counsel. Poor health forced him to return to Toronto in 1891, however, where he died in 1907. MacDonell was interested in Windsor's development, a passion that manifested itself in avid land speculation. His holdings were among the most extensive in town, and he was responsible for opening Goyeau Street and Howard Avenue, which he created by merging Glengarry and Aylmer. Tuscarora Street also owes its name to him; he named the road after an Indian tribe that lived in his native St. Lawrence Valley. He began advertising for settlers as soon as he entered into Windsor's leadership, taking out ads in the Detroit Daily Advertiser for lots available by auction in June 1854. "Windsor is now making rapid progress," the ad trumped, "and from its present prospects and local advantages it must soon become a large and important place." 1 And Samuel Smith MacDonell saw to it that Windsor did indeed become such a city. In 1856, Samuel Smith married Ellen Brodhead, a young American woman from Boston. Their son, Archibald Cameron, was born in Windsor eight years later. He studied at Trinity College School in Port Hope, near Oshawa, and then went to the Royal Military College of Canada in Kingston, from which he graduated in 1886. Although the Royal Artillery gave him a commission, he resigned without actually joining because of extenuating familial circumstances. Archibald began his distinguished military career as a Lieutenant in the Canadian Militia in June 1886. Two years later he joined the Regular Canadian Army, at the same rank, in the Candian Mounted Infantry, Permanent Corps of Canada. In 1889 he was transferred to the North-West Mounted Police as an inspector. Lieutenant MacDonell entered combat in January 1900 as a volunteer in the 2nd Battalion Canadian Mounted Rifles for service in South Africa for the Second Boer War. He joined with the rank of Captain and was promoted to Major in May, becoming commander of the 5th Battalion Canadian Mounted Rifles. His actions during the war earned him entry into the Distinguished Service Order. He returned to the North-West Mounted Police and was promoted to the office of Adjutant, in command of the C Division of the Battleford District in Saskatchewan. In 1907, MacDonell joined the Canadian Mounted Rifles, which would in 1909 become Lord Strathcona's Horse. Named the unit's commanding officer in 1912, he entered into overseas combat again in May 1915 when the regiment was deployed to France to fight as infantry in the trenches during the First World War. 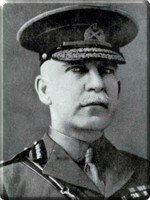 Because of his success on the field, MacDonell was promoted to the command of the 7th Infantry Brigade of the 3rd Canadian Infantry Division in December 1915, and was awarded command of the 1st Canadian Division (one of the Canadian Expeditionary Force's five divisions) in June 1917, which he held until Armistice Day. For his service he was made a Knight Commander of the Order of the Bath and a Companion of the Order of St. Michael and St. George. 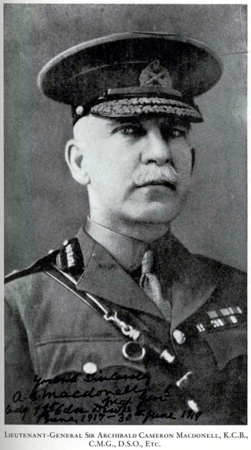 Upon his return from war in 1919, Major-General MacDonell was appointed Commandant of his alma mater, the Royal Military College, a position he held until his retirement in 1925, at which point he was promoted to the rank of Lieutenant-General. 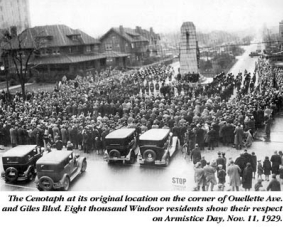 He returned to his home town on Armistice Day in 1924 as one of the highest-ranking and most decorated veterans of the war to unveil Windsor's cenotaph at the intersection of Giles and Ouellette. 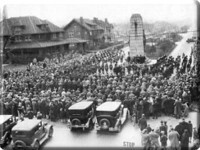 He passed away in December 1941 and is buried at the Catarqui Cemetery in Kingston.